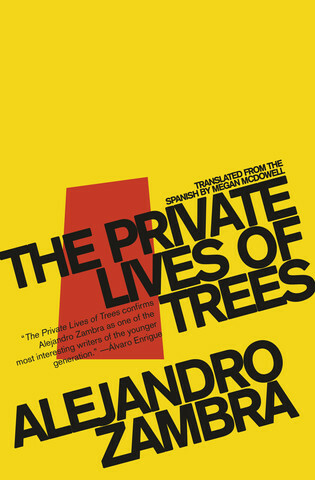 The Private Lives of Trees (translated by Megan McDowell, review copy courtesy of Open Letter Books) is a novella which takes place over the course of a night in Santiago. Julián, a married man with a step-daughter, is telling little Daniela a bedtime story, an ongoing tale which binds the speaker and the listener. The protagonists of the story are two trees, a poplar and a baobab, at a local park, and as Julián talks about the trees’ musings on the bizarre behaviour humans display, he and Daniela have one ear turned to the door, waiting to hear footsteps outside. However, appearances can be deceiving. There are no enemies that we can see, but perhaps Julián should be on his guard. After all, where can Verónica have got to so late at night? I mentioned Muñoz Molina’s In Her Absence above, and in many ways, this is a very similar story (only the place has changed – the male narrator is at home, while the wife is absent…). You could describe it as a novella, but it’s really just a long story, and it has a very similar feel to those in My Documents, with events seemingly unconsciously drifting along, creating a story somewhere along the way. Once again, there’s a great translation by McDowell, one that’s very smooth and has the effect of drawing you into a story that could (and perhaps should) be rather mundane. Stu – A nice, quick read 🙂 By the way, when is Spanish-Language Literature Month – June or July? Stu – Fair enough (I’m sure I’ve got a few to read for it!). Will you be publicising it officially soon? I do like it when one book leads to another so naturally – enjoy your deep exloration of Zambra! I read this last month and loved it although, like Stu, I didn’t review it or at least have not yet. Zambra will almost certainly be factoring into my Spanish Lit Month selections (possibly twice). Love his subtlety, his sense of humor and his grace as a prose writer.